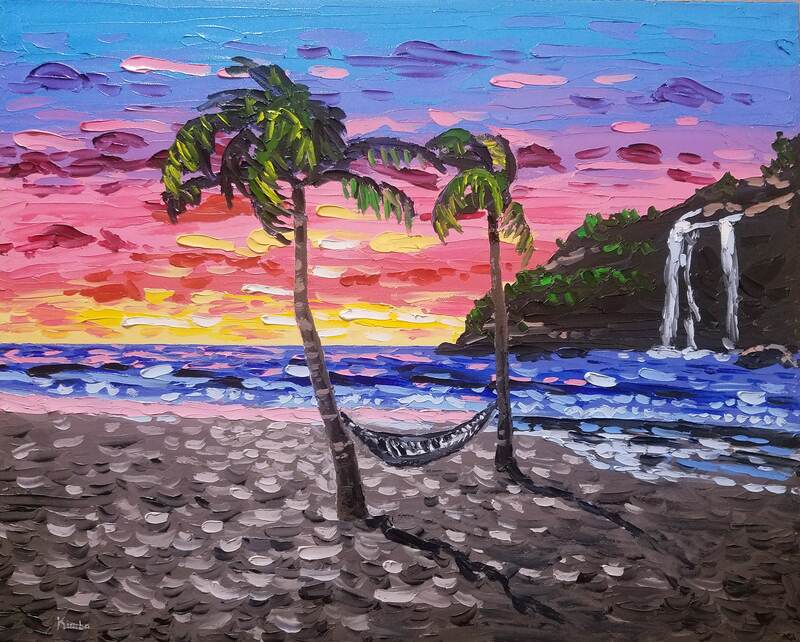 Take a rest in your hammock on a beautiful beach in this canvas painting sunset. Watch the marvelous vivid colors in the sky and listen to the tranquil sound of the glowing waterfall spilling over the mountain. Clear your thoughts of anything holding you back, while preparing for a lovely nap. Good night! This canvas painting sunset is sure to brighten up your home or office. It will also go great with your ocean theme in your bathroom or kitchen. This palm tree painting was painted using only a palette knife. To get my unique painting style, I build up the paint in thick mounds to create a 3-D effect. I also mix my colors directly on the canvas, creating bold and vivid shades. Palm tree painting comes with a certificate of authenticity. **Display: Canvas stapled on the back; edges of canvas are painted black for a modern and finished presentation, ready to hang out of the box! No frame required! **Technique: The beach scene art was painted using only palette knives!